Swity Family: Click to view website. The Siasoco – Oblego Nuptial site. Ooh, this was another fun site I had to make. The second wedding website among my list of projects. 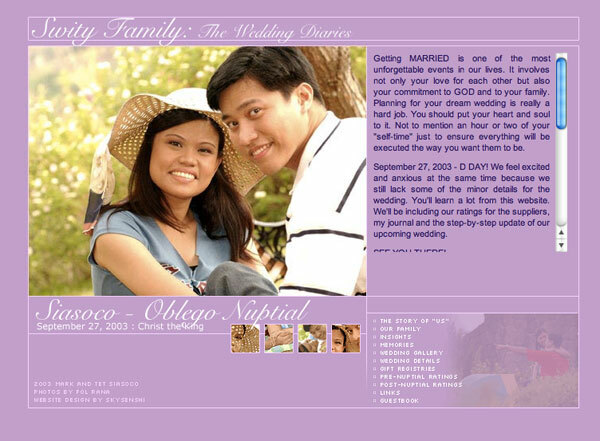 This was actually a wedding gift to Mark and Tet Siasoco, who got married on my mother’s birthday (September 27, 2003). They’re really such a cute and mushy couple. You’ll see mush all over the site, but it’s the kind that makes you go, “Aw!” I based Swity Family’s look from their wedding motif, which was lilac/lavender. The only part of the motif that I didn’t add into the website were the Precious Moments (I didn’t quite know where they fit in), those figurines with teardrop-shaped eyes that this couple really love. I think the site design compliments the pictures that their photographer, Fol Rana, took. This entry was posted by skysenshi on March 16, 2011 at 1:26 pm, and is filed under Web Development. Follow any responses to this post through RSS 2.0.You can leave a response or trackback from your own site.